Walking distance to sights, art, restaurants and coffee houses. Tennis nut who loves to rent holiday apartments himself. The historic old town is all about strolling. One of the city's most magical gardens is only minutes away, the Burggarten or Hofburg Palace Gardens. A splendid Jugendstil palm house is also a popular restaurant and we recommend you take a walk there. Stefan and Emilie were very responsive and helpful to deal with. From booking to departure they were highly responsive and very accommodating. The flat is delightful. A studio of course, but still quiet spacious with a small dining table and perfectly functional kitchen, which we cooked in each night. The flat is well equipped, the bed is comfortable, and it is very quiet, no street noise at all. It is extremely well located. The only time we used transport was taking the train up to the main river. All other mains sites are well and truly in walking distance. A lovely flat, great hosts and a wonderful city. We would certainly book this flat again on a return visit. Super hosts. Quick and clear replies and very welcoming arrival. Studio has all you need, well maintained, good heating and fresh air if required. Very comfortable bed. Thank you Stefan& Emilie!! Very nice efficiency on 7th floor of apartment building near the Opera House in Vienna. Great location. Nice efficiency. Very nice owners, who were very responsive with the few questions and things needed. And all basics we needed was there. This property and owners were amazing. Stefan and Emile were great. They were very accommodating on meeting us when our flight got in and even gave us step by step instructions to the property. It’s centrally located and walking distance to everything! We will definitely stay here again whenever we come back to Vienna. They went above and beyond! Can’t say enough good things about the owners and their property. We are very happy to hear that you have enjoyed your stay with us. We would love to host you again, anytime. Literally around the corner from the Opera (as well as subway, sightseeing buses, trams), and yet a very quiet apartment. Very clean and comfortable. Emilie was a great host and addressed an issue that emerged right away. It was also very easy to communicate with Emilie by email, since she was incredibly prompt in responding. The apartment looks freshly finished, with clean furnishings, and no clutter whatsoever, which is important for us as my husband has asthma and old stuffy places don’t work well for us as a result. Overall, it was a pleasure staying at Stefan and Emilie’s apartment, and we will definitely recommend it to our friends as well as choose the apartment again if we come back to Vienna. This is a very nice, quiet studio apartment "inside the Ring" in central Vienna. The location is unbeatable -- close to public transportation, a block from the Opera, a block from the main pedestrian shopping street within the old city. The hosts, Stefan and Emilie, were extremely responsive and helpful. Emilie met us at the flat and showed us how to make everything work, including the espresso and washing machines and the TV. 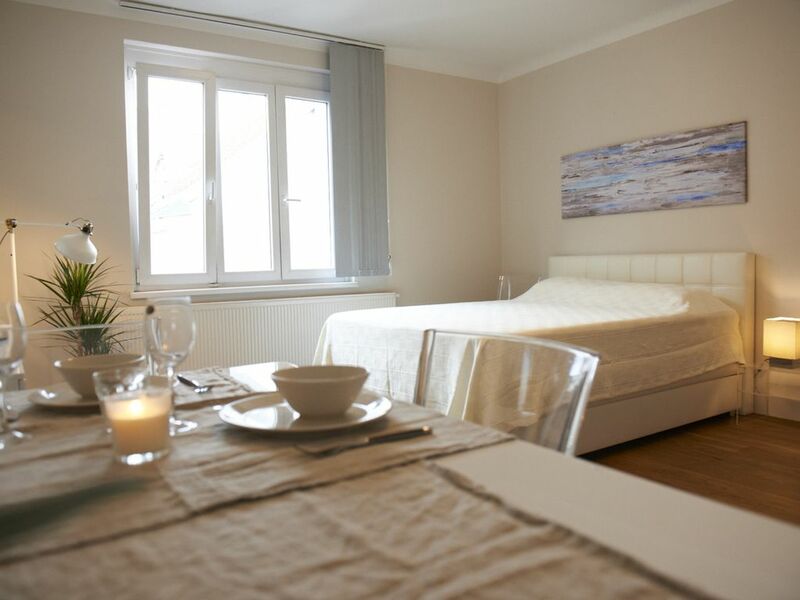 The apartment is light and airy, fully equipped and furnished to a high standard. It has a modern bathroom and a good shower. The only drawback is the lack of air conditioning. Although helped by a couple of fans, it was still quite warm at night with daytime temperatures in the mid-80s. Nevertheless, unbeatable for the price and location.